This is a tragic story which I find it real hard to “understand.” WF is 32 years old. In early 2014, WF felt a lump in her left breast. At that time she was pregnant and was about to deliver her baby. So nothing was done until after the birth of her baby. A trucut biopsy was done on 12 April 2014 confirmed an invasive ductal carcinoma. WF consulted another doctor in another private hospital. 25 April 2014Ultrasound of Both Breasts Irregular hypoechoic lesion between 1-2 o’clock. It measures 23 x 18 x 12 mm. Some microcalcifications seen. In keeping with a neoplasic lesion. Based on the above, WF had surgery. A wide local excision of the left breast mass was done (lumpectomy). The tumour removed was 23 mm in size. Two of the axillary lymph nodes were involved. All resection margins were free of malignancy. Immunohistochemical study indicated a triple negative tumour: ER negative, PR negative and c-erb-B2 negative. It was a Stage 2B cancer. 9 May 2014Ultrasound of Thyroid Multiple tiny nodules seen on both thyroid lobes, likely benign. WF subsequently had 6 cycles of chemotherapy. Neither she nor her husband knew what drugs were used. Anyway, each cycle cost RM 6,000. WF lost her hair, felt tired and nauseous during her treatment. Chemotherapy was completed by October 2014. Then WF received 20 sessions of radiation and this was completed in November 2014. About a month later, in late December 2014, the cancer spread to WF’s brain. There were 3 lesions in her brain. WF received 2 sessions of radiation to her head in January 2015. Two months later, March 2015, CT scan showed the cancer had spread to her lungs, bone and liver. WF was again asked to undergo 4 cycles of chemotherapy. WF did one cycle after which she and her husband came to see us and decided not to proceed with the treatment. Chris: Did you ever ask the doctor if surgery, chemo and radiation were going to cure your cancer? Husband: The doctors said there is a 80 percent chance of cure? Chris: Did you ever ask what happen to the remaining 20 percent? Study the numbers of her blood tests. In March 2015, WF was started on chemotherapy again because her CA 15.3 started to rise, indicating that the earlier chemotherapy had failed. Therefore, the answer is more and more chemo? The following are results of her CT scan and MRI. 9 May 2014CT scan of Brain, Neck, Chest, Abdomen and Pelvis Recent wide local excision of left breast carcinoma and left axillary clearance.Brain: There is no shift in the midline structures of the brain. No mass or abnormal enhancement. No extracerebral fluid collection.Lymph nodes: There are no enlarged supraclavicular, axillary, internal mammary, mediastinal or pulmonary hilar nodes.Lung: There is no pulmonary nodule or other significant pulmnary abnormality. Liver: Liver parenchymal density is normal. Two small hypodense lesions in segment 8, both measuring 4 mm and another two hypodense lesion in segment 7, both measuring 3 mm. Likely represent small cysts. Bone: no significant lytic or sclerotic bone lesion seen. 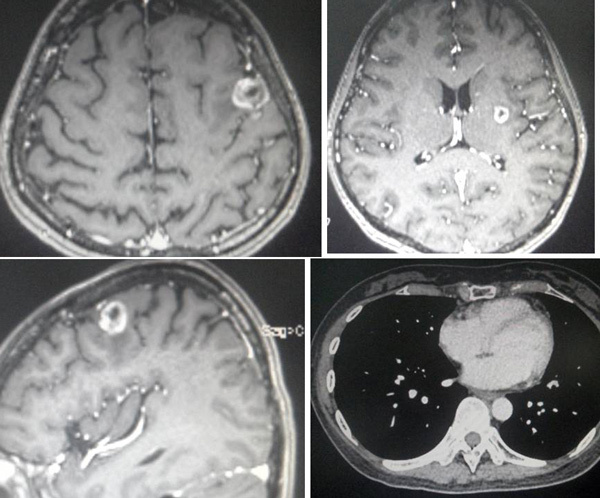 9 January 2015MRI of brain Bilateral cerebral metastases.Left frontal cortex – 21 x 16 x 15 mm well defined multilobulated massLeft basal ganglia – 9 x 8 x 9 mm.Occipitotemporal cortex – 8 x 8 6 mm. Lesions also associated with perilesional oedema. Basal segment of left lower lobe – 4 mm nodule. There is no associated perilesional oedema. Perilesional oedema has also increased. 7 April 2015CT scan Neck, Thorax and Pelvis Increased size of pulmonary metastases. Interval development of hepatic and skeletal metastases. 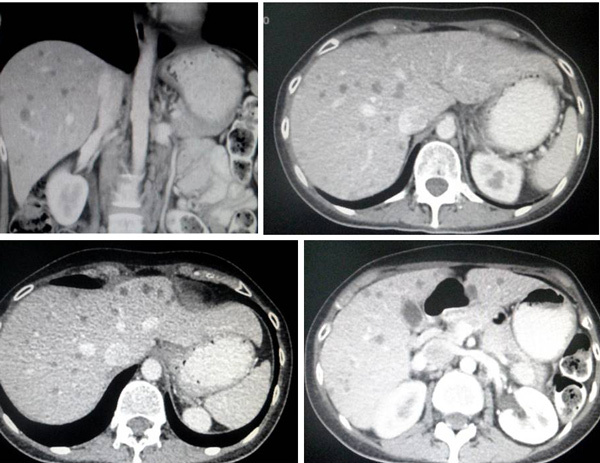 And mild retroperitoneal lymphadenopathy.Lung: Apical region of left upper lobe – 4 mm nodule with central cavitation.Right lower lobe – 4 – 5 mm noduleBasal segment of left lower lobe – 4 – 5 mm nodule. Liver: Numerous small hypodense lesions inn both lobes of liver. Larger lesions measuring up to 15 mm. Lymph nodes: Multiple mildly enlarge para-aortic lymph nodes – measuring up to 12 mm. Smaller lymph nodes are present along the aortocaval space. Bone: There is an irregular poorly defined lesion in the manubrium sterni eroding the bony cortex. There is also suggestion of similar lesions in the lower cervical spine. We need to acknowledge that the oncologist did a “good” job of taking the base line of WF’s health before chemo and radiation were started. Yes, before the treatments, WF’s brain, lymph nodes, lung, liver and bone were all clear! Meaning at that point in time, her cancer did not spread anywhere! So the doctor confidently told WF and her husband that there was a 80 chance of cure! Then chemotherapy and radiotherapy were started. Barely a month after treatments were completed, problems started to show up. First, the brain. There were 3 metastatic spots in the brain. There was no such tumour before right? Radiation was given to the brain. The tumours shrunk a bit — by just a bit — and then started to grow again. By end of March 2015, WF’s CEA started to increase telling us that chemotherapy / radiation had failed. Then, more chemo was suggested. WF had one cycle of this second-round chemo. In April 2015, CT showed the cancer had spread to her lung, liver, lymph nodes and bone, besides the brain. April 2014 she was diagnosed with a 2 cm malignant breast lump. A year later, April 2015, the cancer had spread to her brain, lung, liver, lymph nodes and bone. She did surgery, chemo and radiotherapy as dictated by the doctors. How could this be? Why do the treatments when the cancer cannot be contained or cured? Dare you ask, what if WF were to do nothing? Just leave the lump as it is. Would she end up the way she is now – with more cancer all over in the body? Is WF’s case unique or exceptional? There are many more tragic stories like this. Here is another example, click this link: Does chemotherapy make sense? When asked if the treatment would cure her cancer, WF was told, There is a 80 chance of cure. Do you believe this prognosis? Listen to another story: Breast Cancer: Do this chemo – 100 percent cure! You believe that? Is The Present Day Cancer Treatment Based on Faulty and Inadequate Science? Some people may wish to say this is a triple negative cancer. So it is an aggressive type! Some people may say it is just your luck! My response: Many patients live a healthy life by making a CORRECT choice! It is your life. Jane had a 1.2 cm lump in her right breast. Like WF above, she did a lumpectomy. Her tumour was a double negative type — negative for ER, negative PR but strongly positive for c-erbB-2. P53 was strongly over-expressed. Jane was told to undergo chemotherapy. The package of chemotherapy + Herceptin would cost RM 120,000 while radiotherapy cost an additional RM 35,000. Jane was told that the benefit of chemotherapy and radiotherapy would be 16 percent – i.e. 16 out of 100 women are alive and without cancer because of the combined therapy. To Jane the benefits of chemo and radiation did not make sense. She promptly refused further medical treatments and came to seek our help on 10 January 2010. Jane told us that she refused chemotherapy because she did not want to lose her hair. In addition, her mother-in-law had lymphoma and died after two cycles of chemotherapy. This entry was posted in Breast Cancer, Failure Story and tagged bone, brain metastasis, breast cancer, liver, lung, radiotherapy, surgery. chemotherapy by CA Care. Bookmark the permalink.